Carillon bells are cast from bell bronze, an alloy composed of approximately 78% copper and 22% tin, which is heated in a furnace to above 2,000 degrees Fahrenheit, until it melts and combines into a homogeneous liquid. The molten metal is then poured into a mold made up of a core, which is the shape of the inside section of the bell, and a cope, which is the shape of the outside of the bell. A bell's weight and profile, or shape, determine its note and the quality of its tone. Once cast, a bell must be tuned. Most musical instruments produce a complex set of harmonically related overtones, or partials. A bell, on the other hand, produces a sound whose partial tones are not necessarily harmonically related. To produce a pleasing, harmonically related series of tones, the bell's profile is very carefully adjusted, or tuned, by the bell founder. Bell founders tune five principal tones of a bell. These are the hum tone, the lowest-pitched partial, produced by the vibration of the entire bell. An octave above that is the prime. This is the tone for which the bell is named, because it is also the pitch of the strike note, the most prominent tone heard when the bell is struck. Next is the tierce, sounding a minor third above the prime. The tierce is unique to bells and gives them their somewhat plaintive sound. Above that is the quint, a partial sounding a fifth above prime, and last is the nominal, sounding an octave above the prime and two octaves above the hum tone. There are many more partial tones, but these are usually the only ones tuned. The casting process isn't sufficiently precise to produce a perfectly tuned bell profile, so carillon bells are cast slightly thick, then put on a lathe (see picture) where metal is cut from the inside surface to adjust the various partial tones. Each partial is tuned separately, by removing metal from a different area of the bell. The tuner aims to get the partials into a harmonically related series in which the strike note of the bell is in tune with the other bells in the ensemble. 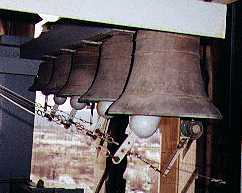 Once tuned at the foundry, a bell never needs further tuning in the tower. Bells over 300 years old sound as they did when they left their maker's hands. A bell's greatest enemies are fire, which can destroy the bell, and air pollution, which dissolves the bell metal, thus affecting the tuning.